20th Century Fox has announced a home video release date for the remake of of Tobe Hooper‘s supernatural horror classic Poltergeist. We have details on the upcoming release and your first look at the home video cover art after the break! The film will see release on DVD, Blu-ray, and 3D Blu-ray September 29th. It will hit Digital HD more than three weeks beforehand on September 4th. 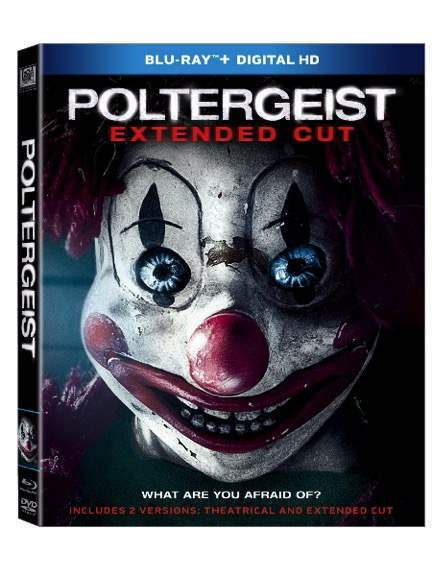 The Blu-ray release will include and alternate ending and and extended cut of the film as well as image galleries and trailers. Check out the cover art for the Blu-ray release below. The redux is directed by Gil Kenan and written by David Lindsay-Abaire. It stars Sam Rockwell, Jared Harris, Rosemarie DeWitt, and Nicholas Braun. The project is produced by dynamic duo Sam Raimi and Rob Tapert via the Ghost House production label. Like in the 1982 original, the core concept of a family’s youngest child being taken away by supernatural entities will remain in tact. But the concept has been updated for modern audiences in an attempt to try to improve upon some of the elements of the original film that may not have aged particularly well. We will keep you apprised as more news is made available. Waxwork Remake May be in the Cards for Directors of Lost After Dark!